This year, July 4th lands on a Monday, and celebrating our nation’s independence doesn’t have to cost a ton of money. The 4th of July is one of those holidays you can celebrate frugally and still have a blast. The weather is usually warm, you don’t have to exchange gifts with anyone, and tasty, affordable food is easily accessible. What’s not to love? 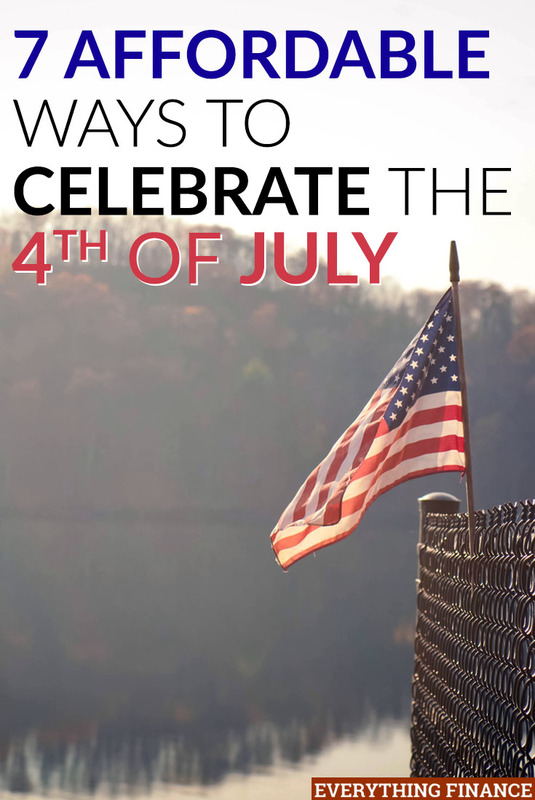 Whether you plan to stay in town or travel for the upcoming holiday, here are 7 budget-friendly ways to celebrate the 4th of July this year. Whenever I hear people talk about purchasing a ‘4th of July outfit’ I get so confused. Why spend money on patriotic-themed clothing that you’re probably only going to wear once? I get that it’s a holiday, but purchasing patriotic-themed items that won’t be used afterward isn’t the best use of your money. Instead, go through your closet and see if you can find clothing that represents the color of the flag. If you must buy something new, consider getting something that you can wear multiple times throughout the summer. If you have kids, a fun activity can even be making your own red, white, and blue tie-dye shirts. For decorations, see if you have anything leftover from Memorial Day that you can use to make your home more festive. Also, check out the ‘DIY decorations’ section of Pinterest for themed ideas. Cheap places to get materials include the dollar store and the dollar section of Target. Parades are fun, free, and a great way to start your holiday morning. Going to parades brings lots of memories back for me from when I was a child. Kids love to wave at their favorite characters and people, see cool performers, and pick up candy that gets tossed out. Attending a 4th of July parade in particular is a great way to honor special people who have done great things to improve your community. Plus, you can receive plenty of freebies and learn more about programs and groups in your area. The 4th of July is not the same without catching a fireworks show. See where your local town is hosting a free fireworks show this year so you can bring some blankets, pack some snacks, and attend. DIY fireworks shows may sound fun at first, but they can be costly and potentially dangerous if you don’t know what you’re doing. This is why I leave that area of the celebration to the professionals and simply enjoy the show. If your own town doesn’t have a fireworks show, odds are, a neighboring town does. Cookouts are generally cost effective during the summer, but hosting a BBQ can really add up when you consider purchasing food, drinks, paperware for guests, decorations, etc. If someone you know is hosting a cookout, offer to bring a dish and let someone else take on the responsibility of hosting a meal for a change. That way you’re still contributing, but you don’t have to worry about the hassle of all the planning and cleanup. Potlucks are another good alternative and allow everyone to take responsibility for providing food. There’s almost always some expensive and overcrowded festival going on during the 4th of July. Sometimes, amusement parks and water parks even advertise deals and discounts to get people to celebrate the holiday at their location. While these ideas sound fun, if you’re on a budget, they may not be so fun for your wallet. Plus, even with free events, it can get pretty crowded during the day time which can take away from your overall experience, so you have to make a judgement call on your part. A frugal alternative to going out to carnivals is to invite some friends over and have fun right outside your own home. You can turn on your sprinkler on for water activities and games, play badminton or volleyball in the yard, or even head to an open field and play a game of softball or soccer with a large group. I’m big on being able to look past the generic themes of popular holidays and focus on the true meaning of why the particular day is nationally recognized. If you like to learn new things or have kids who seem like they’d be curious, visit the historic downtown area of your town or an older part of your neighborhood that shares some history about your city and some of its first residents. While museums and libraries will most likely be closed on July 4th, you can conduct your own research and visit public monuments and memorials. If you live on the East Coast where the cities are much older, this could be a fun outing. If you are one of the brave people who have travel plans for the holiday, consider staying in an AirBnb property if you don’t have lodging arrangements set up with friends or family. Hotel prices will probably by sky-high during that weekend, and you can save a significant amount of money if you split the cost of an AirBnb with others. What are you plans for the 4th of July and how do you plan on saving money during the holiday?